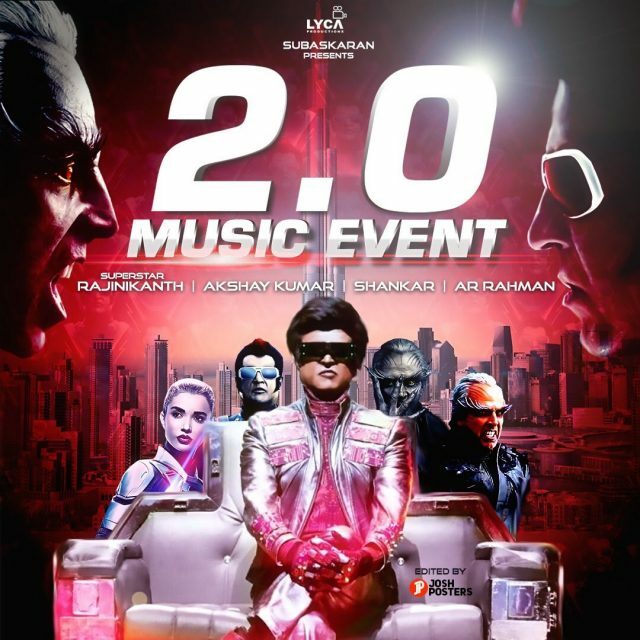 The music album of 2.0 has only 3 songs and the makers unveiled two of them at the audio launch event. Shankar’s association with musical genius A.R.Rahman goes back to early 90s. The first time the two collaborated for ‘Kadhalan’ which created chartbuster numbers like ‘Urvasi Urvasi’ and ‘Pettai Rap’ which are till date one of the most crooned numbers. Shankar has teamed up with Rahman for all his movies since then barring ‘Anniyan’ and ‘Nandan’ which was rendered by Harris Jayaraj. The two have joined hands now for 2.0 which stars superstar Rajinikanth in the lead and is a sequel to the 2010 release ‘Enthiran’. Produced by Lyca Productions, 2.0 is in post-production stage currently and is gearing up for a January 2018 release. The makers released the music album of 2.0 in Dubai on 27th October, 2017 and the event was a spectacular one. The music album of 2.0 has only 3 songs and the makers unveiled two of them at the audio launch event. Titled ‘Endhira Logathu’ and ‘Raajali Nee Gaali’, the songs are trademark A.R.Rahman style and will grow on us as you listen to it. ‘Endhira Logathu’ is sung by Sid Sriram and Shasha Tirupati while ‘Raajali Nee Gaali’ is sung by Blaaze, Arjun Chandy and Sid Sriram. The songs have already become hits and 2.0 mania is all around. Super Star Rajinikanth will be seen reprising both the roles he played in Enthiran, Vasikaran and Robo Chitti, in 2.0. Besides superstar Rajinikanth, 2.0 also features Bollywood actor Akshay Kumar and Amy Jackson in other lead roles. 2.0 will be the most expensive film in the career of Rajinikanth and director Shankar, and is being made on a mammoth budget.